Upon purchase of any of the web-based CBT courses, you will receive an email within the next 24 hours, which will include direct hyperlinks to our online computer based training as well as additional information on how to use the software package. If additional reference materials are ordered, they will be shipped via UPS ground. Arrival date for such packages vary according to location. Please review the technical requirements for our web-based CBT before submitting your order. 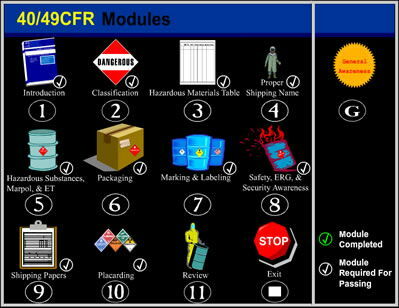 Web based training for 40 / 49 CFR Waste. Reference and Textbook are sold for extra.